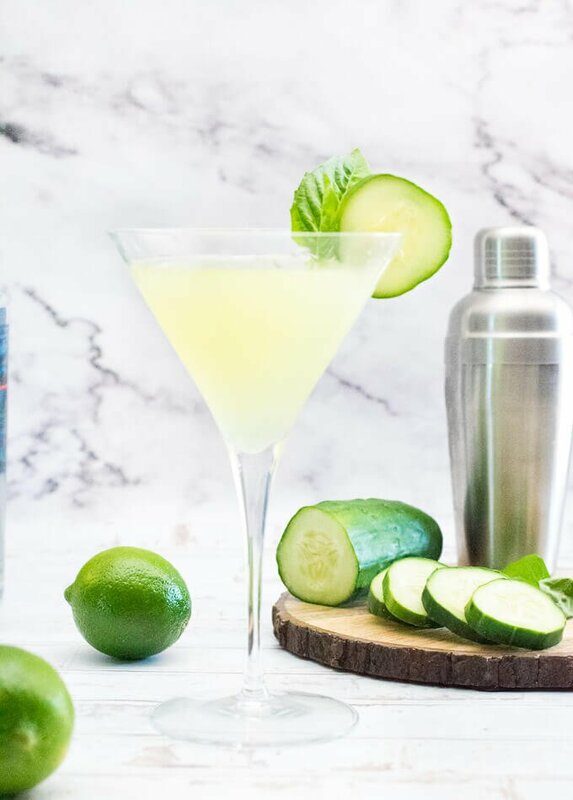 This cucumber martini is accented with the lively flavors of fresh basil and lime, for a taste as refreshing as it is refined. I sincerely believe the best tasting food and drink is locally produced. Not only are locally sourced ingredients the freshest available, but I personally get a greater sense of emotional satisfaction knowing I am supporting my neighbors and building a stronger community in the process. However, you don’t have to spend a lot of money at a high-end cocktail lounge to enjoy a masterfully crafted artisan drink. All it takes is one quick stop at your local Meijer Supercenter to pick up the freshest produce around, as well as a locally crafted artisan vodka to really make your martini sing! This cucumber martini recipe is as good as anything you will be served at the most refined cocktail lounges. Heck, local never tasted so good. A traditional martini is a strong cocktail crafted with gin or vodka and a swirl of vermouth. However, over the years many more flavorful variations have taken on the martini name. Cocktails such as my cucumber martini feature more flavorings than their original ancestor but still showcase the liquor as a major flavoring agent. Since the vodka is a primary component of the martini’s taste, it is important to use a high-quality vodka. Using a lesser quality vodka will impart an unpleasant astringent burn into each sip, masking many of the other flavors present. Whereas a premium vodka will lend a smooth taste that highlights the flavors of the martini while also making the cocktail more pleasant to drink. 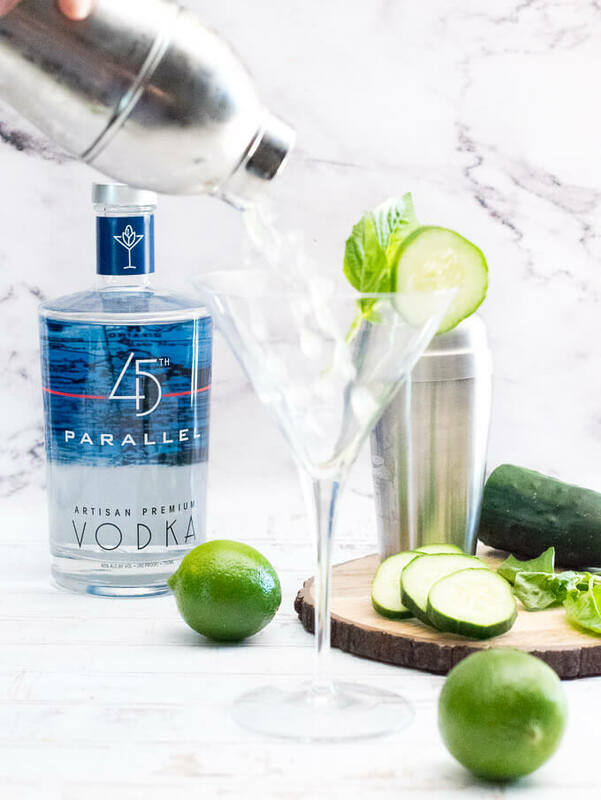 I am using 45th Parallel Vodka for my Cucumber Martini. It is a locally distilled vodka, crafted nearby in New Richmond, Wisconsin and sold at my Meijer Supermarket. I can always count on Meijer to have a great selection of local products. Like Meijer, 45th Parallel puts an emphasis on local sourcing, using local ingredients whenever possible. 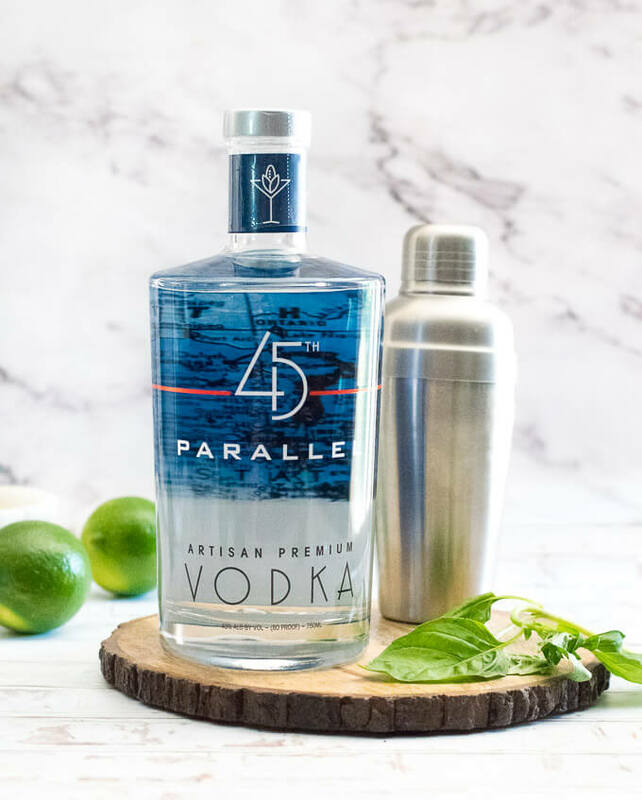 45th Parallel distills their corn-based vodka in small batches to avoid unwanted flavors, for a perfectly clean balanced taste that is ideally suited to star in a high-end martini. Additive-free and hand bottled, this is a great artisan alternative to other mass-produced varieties. If you have never experienced the fresh flavor of cucumber in a drink, get ready to fall in love! 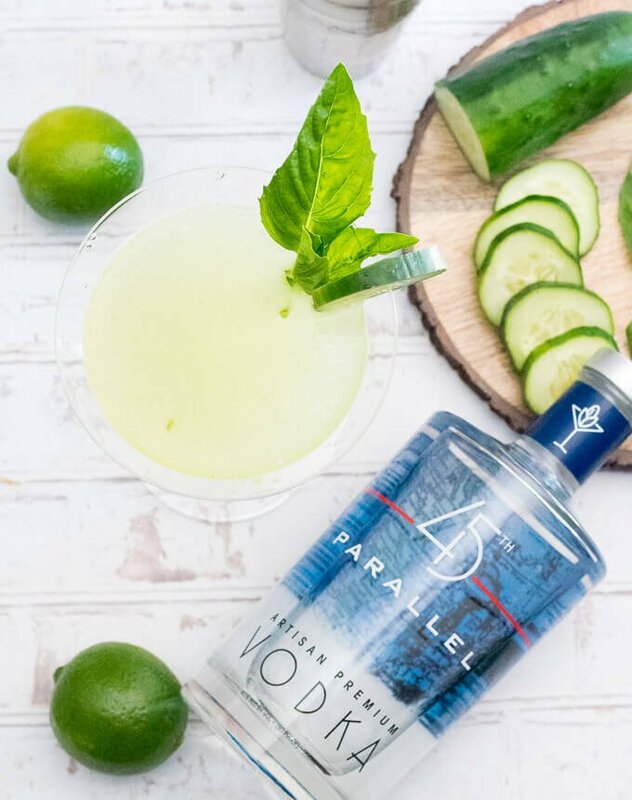 The cool taste of cucumber juice blends beautifully with vodka and provides the perfect base for the bright punches of basil and lime that accent this flavorful cocktail. 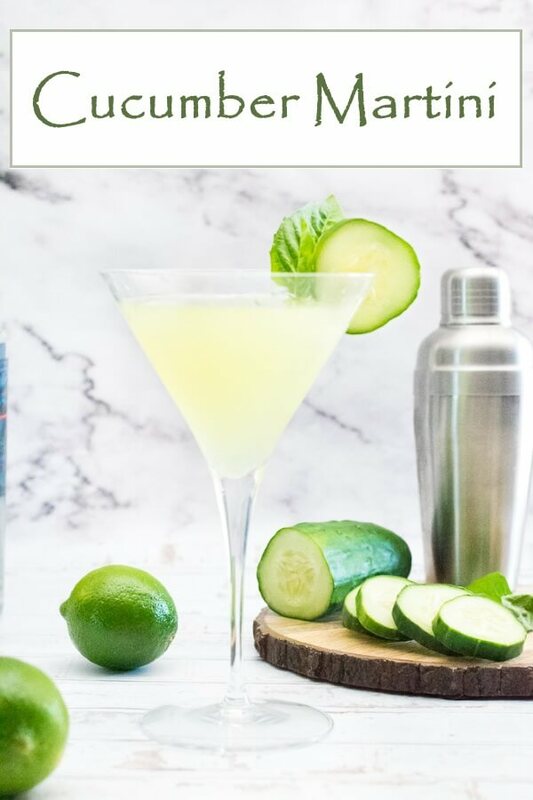 This cocktail is best prepared in a cocktail shaker, as you will want to muddle the cucumber and basil to extract the flavors into the drink. I prefer to muddle the cucumber and basil along with the simple syrup because the simple syrup does a great job drinking up the flavor. The best way to muddle cucumber is to peel the skin off, slice it in half and scoop out the seeds. Then chop it into 1″ chunks. Place these chunks in a cocktail shaker and proceed to smash them down with a cocktail muddler, this will release the juice from the cucumber. When the finished martini is strained from the shaker, the smashed pulp will be separated from the liquid and left behind. Place cucumber chunks into a cocktail shaker with torn basil and simple syrup, and muddle to release juice from cucumber. Add vodka, lime juice, and a handful of ice to cocktail shaker, cover with lid and shake vigorously. Once the exterior of the shaker is frosty cold, pour into a martini glass. Garnish with basil and cucumber slice (optional) and serve. IF YOU LIKED THIS RECIPE check out my Amaretto Stone Sour cocktail too! 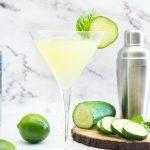 If you enjoyed reading my Cucumber Martini recipe then you should probably like me on Facebook and follow me on Pinterest too. That’s what I would do at least, because if you don’t get to know me but you still use my recipe it is kind of like taking candy from a stranger, and your mom taught you not to do that. Don’t disobey your mom, subscribe to Fox Valley Foodie today. Wow that tasted really fresh! I never had a martini like that!